During the month of December, Mary Hogan Elementary School continued hosting its monthly taste tests, this time featuring Vermont’s Harvest of the Month, winter squash. Nutrition Outreach and Mentoring would like to thank Katelyn Jaring, Mary Hogan’s head cook with the Abbey Group, along with the rest of the food service team for their hard work in preparing enough maple butternut squash to serve around 200 samples. During each lunch period NOM volunteers distributed winter squash samples and students recorded their reactions on taste test ballots. The ballots invited students to rate the sweet potatoes: “Like!”, “Sort of…” or “Don’t like”. 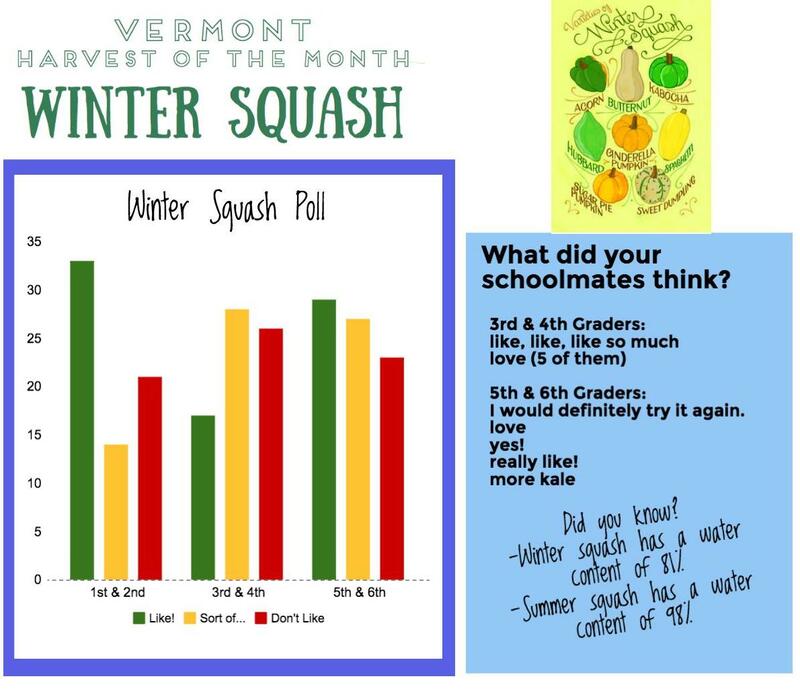 Overall, 36% of the students responded that they liked the winter squash samples, 32% sort of liked the samples, and 32% did not like the winter squash samples. One student declared they would “definitely try it again”. Other students “really like” the samples, and “love” the samples. Did you know? Winter squash has a water content of 81% and summer squash has a water content of 98%. Visit http://www.vermontharvestofthemonth.org/december–winter-squash.html for more fun facts!